Escape the hustle and bustle of city life to this home in the Redwoods. This amazing home is located near the Boulder Creek Golf and Country Club. 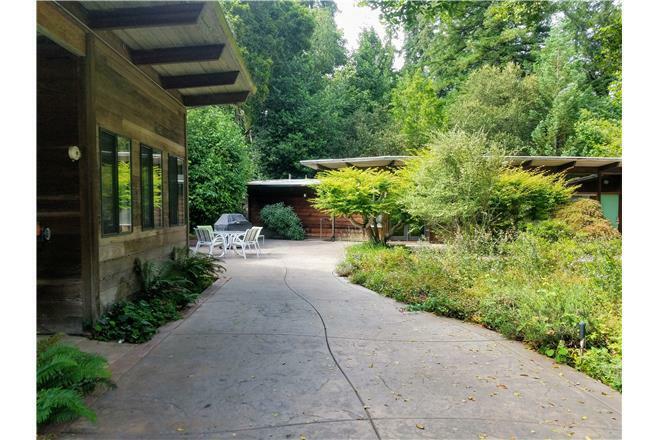 This gorgeous 3-bedroom, 2-bathroom vacation rental with its charm and elegance and offers a quiet and peaceful retreat and expansive decks, inviting hot tub and fire pit all while being settled in among a forest backdrop. This property is situated to grant you access to dozens of great area activities. Golfing, Hiking, Beach and much more! Enjoy the spacious, custom designed, Hoffman House. Room to roam in the two-bedroom main house while your friends enjoy their own private studio. Our serene home is 3.5 miles to the famous Beach Boardwalk and 1.1 Miles to the spectacular Pasatiempo Golf course. Easy access to the Hwy 17 makes getting there a breeze. This place is perfect for a family gathering or just a getaway with special friends. Spend days at the beach or enjoy a book. Please note that the main house has 2 bedrooms and the Studio is about 20 feet from the main house and has two twin beds and a futon couch and a TV. The bathroom in the Studio has a shower, but no tub. The property is near the freeway and yes, the noise does carry, but it is a 'white noise' not a 'race track' noise. $255 - $499 per night. 30% down to hold a reservation. Balance due 60 days before check-in. 4% processing fee. Listed rates do not include tax. Holiday and peak season rates and required length of stay may be different than quoted above. Credit cards, cash, checks and wire transfers accepted. Minimum night stay varies amongst the various rental units. Many rentals have 30-night minimums.